In Danse Macabre, Stephen King observes that the movies provided a “cultural echo chamber” for Mary Shelley’s “modest gothic tale” (65) and that the novel has “probably been the subject of more films than any other literary work in history, including the Bible” (62). He is right. From Edison’s 1910 silent movie to our modern IMAXs, movies inspired by a 19th-century teenager’s novel have remained an enduring part of our movie history and, in turn, these films have seared images of the creator and his creature into the mainstream of our cultural consciousness. According to IMDB, some 200 titles with the word “Frankenstein” embedded within them have been produced, and that figure does not take into account the numerous films that appropriate portions of Shelley’s narrative to raise profound questions about the future of technology and the definitions of personhood. Amidst all the serious attempts to bring Shelley’s Frankenstein (1818) to the screen, moviemakers have created a host of parodies, including The Rocky Horror Picture Show (1975), Igor (2008), and Frankenweenie (2012). Our video essay, “Horror and Humor: Frankenstein’s Comic Offspring,” explores the most famous of these comedies, director Mel Brooks’s Young Frankenstein (1974). To laugh at something that once was frightening loosens its psychological grip on us; it allows our rational mind to triumph, at least temporarily, over the instinctual trepidations that lay beneath the level of conscious articulation. Freud noted, for example, how children create games around the very things they most fear as a way of subduing those fears and gaining control. No genre has been more prone to parodies than monster movies because films that scarred one generation can become historical relics for the next, devolving scary creatures into figures of fun. Such productions take the sting out of horror movies by robbing them of their power to traumatize, frighten, or offend us. But comedies should often be taken seriously for the insights they offer, and Young Frankenstein is a prime example of how humor can shed light on complicated ideas. Brooks explicitly “tries to stay with the look and feel and texture” (Newsweek interview) of James Whale’s classic 1931 movie (Frankenstein) and his 1935 sequel (The Bride of Frankenstein) by incorporating many of the classic characters from the previous iterations of the narrative and reviving stock Frankenstein characters from film history’s graveyard: Frankenstein’s grandson Frederick (Gene Wilder), the huge monster (Peter Boyle), the lovely fiancée Elizabeth (Madeline Kahn), the wooden-armed police office Inspector Kemp (Kenneth Mars), the hunchbacked laboratory assistant Igor (Marty Feldman), the pretty ingénue Inga (Teri Garr), and the faithful housekeeper Frau Blucher (Cloris Leachman). To maintain the spirit of earlier versions, Brooks integrates early film transitional devices such as vertical and horizontal wipes, as well as in and out irises. He also resists using zooms, other than the last shot, instead allowing the camera to trundle into scenes as did Whale in his movies. 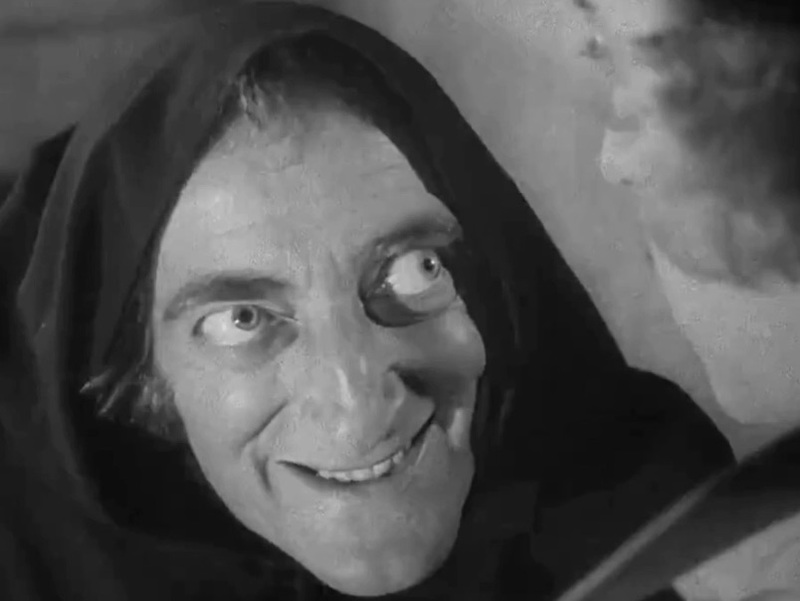 Yet Young Frankenstein’s characters have a decidedly modern consciousness of their roles within the Frankenstein legend; they mug for the camera, overact, and offer sly smirks of understanding that establish their knowing wit within a whimsical playground of nostalgic parody. The audiovisual format of the video essay is a particularly effective way to communicate how Brooks alters some fundamental elements found in the Frankenstein narrative, particularly focusing on the unique ways he modulates the relationship between the creator and his creature. In essence, Brooks radically changes the conventional portrait of the evil scientist into a loving tableau of a parent who risks his own life to save his offspring. The audiovisual format, therefore, allows us to pinpoint particular scenes in the movie that demonstrate these changes and, simultaneously, to incorporate a voiceover narration that stresses how these shifts re-configure Shelley’s story. In this way, the conjunction of words and images allow the viewer to understand how Brooks cleverly transmits important ideas from Mary Shelley, adeptly uses conventions established in previous movies, and skillfully adds his particular point of view to create a movie that, while it makes the viewer laugh, should also make him/her think more carefully about a range of complicated issues. Friedman, Lester D. and Allison B. Kavey. Monstrous Progeny: A History of the Frankenstein Narratives. New Brunswick: Rutgers University Press, 2016. Gostin, Nicki. “The Pride of Frankenstein.” Interview with Mel Brooks. Newsweek. Nov. 3, 2007. https://www.newsweek.com/pride-frankenstein-96235. King, Stephen. Danse Macabre. New York: Everest House, 1981. Lester D. Friedman, Ph.D., is Emeritus Professor and former chair of the Media and Society Program at Hobart and William Smith Colleges. Prior to his time at HWS, Professor Friedman taught cinema studies at Syracuse, Northwestern, and American Universities, as well as the Art Institute of Chicago. He also taught health humanities and bioethics at Upstate Medical Center (Syracuse) and the Feinberg School of Medicine at Northwestern University (Chicago). The author, co-author, and editor of over 20 books and numerous articles, his areas of academic specialties include: film genres, American cinema of the 1970s, American Jewish cinema, British film of the 1980s, and Health and Humanities. Additionally, he has written books about Steven Spielberg, Arthur Penn, Peter Pan, Frankenstein, and Clint Eastwood. Currently completing a book on sports and American culture, professor Friedman is also a JEOPARDY! Champion. Kristine Vann, a recent graduate from Hobart and William Smith Colleges, completed a double major in Media & Society and Studio Art, with concentrations in Critical Method and Mass Media Theory and Photography. She served as a Teaching Assistant for the Art & Architecture department, a Photographer for the Communications Office, and as a Research Assistant for Emeritus Professor of Media & Society Lester Friedman. This past year Vann was inducted into the Phi Beta Kappa Honors Society, the National Communications Association, and was awarded the Gilman International Scholarship – through which she studied Italian and art history in Rome, Italy. She currently serves as the Marketing and Design Fellow for the Kitchen Theatre Company (Ithaca, NY) and intends to pursue a Masters in both film preservation and critical analysis.